Add some Mediterranean flair to your décor with Afternoon in Provence by Dimensions. Both counted cross stitch designs are included and look great framed together or separately. Finished size: 6" x 6" each. Designed by Kathryn White. © Kathryn White. Counted cross stitch kit includes: • Presorted cotton thread • 18 count white Aida • Needle • Easy instructions..
Let your imagination take flight with these jewel toned hot air balloons. 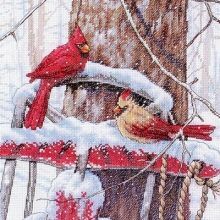 This counted cross stitch design uses both full and half cross stitches to achieve the realistic finished effect. Kit contains cotton thread, 18 count ivory Aida, color-coded thread sorter, needle, and easy instructions. Designer: Nicky Boehme..
Let yourself drift away to this lovely Bayside Cottage by Dimensions. This lush scene in counted cross stitch uses half cross stitch for subtle shading. Finished size: 7" x 5". Designed by Kate Beetle. © 2014 Kate Beetle. All rights reserved. Licensed by The Intermarketing Group, Amherst, NH. Counted cross stitch kit includes: • Presorted cotton thread • 18 count ivory Aida • Needle • Instructions.. 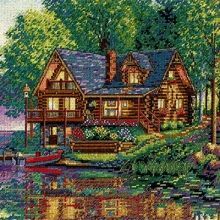 Counted cross-stitch Each kit contains: Fabric Aida 14 Cotton thread Thread palette Needle Instructions Finished size is 7" X 5"..
With beautiful detail, this outdoor scene is like looking through a window. The Charming Waterway counted cross stitch kit from the Dimensions Gold Collection uses half cross stitch to obtain its subtle shading. Finished size: 16" x 11". Designed by Viktor Shvaiko. © Viktor Shvaiko / Art Licensing. Counted cross stitch kit includes: • Presorted cotton thread • 16 count dove grey Aida fabric • Ne.. Imagine yourself taking a stroll through this beautiful Mediterranean village. 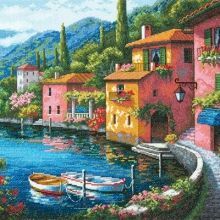 Exquisite shading and details make this counted cross stitch Coastal View a true masterpiece. From the Gold Collection. Finished Size: 15" x 12" (38 x 30 cm). Kit contains presorted cotton thread, 18 count ivory cotton Aida, needle, and easy instructions. Designer: Sam Park. © 2010 Sam Park / Soho Editions / Applejack A..